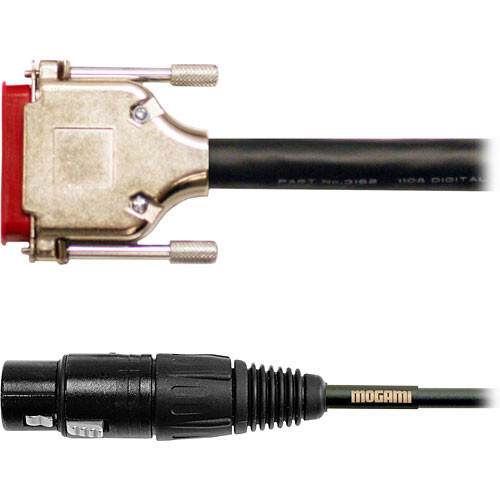 This 5' Mogami Gold AES/EBU DB25 to 4 XLR Male & 4 XLR Female Digital Audio Cable meets AES/EBU specifications with 110-Ohm impedance. Its cellular PP (polypropylene) insulation material allows for larger sized conductors in the cable and less signal attenuation. The 8-channel I/O design of this cable and its specific Yamaha-style pinout makes it compatible for use with Apogee, Mackie, Sony, and Yamaha digital recording machines that use DB25 or XLR AES/EBU connectivity. Since AES/EBU digital audio cable has low capacitance characteristics, it can result in high-quality analog audio transmission in general, especially for high frequency range material. Box Dimensions (LxWxH) 10.945 x 7.795 x 2.047"